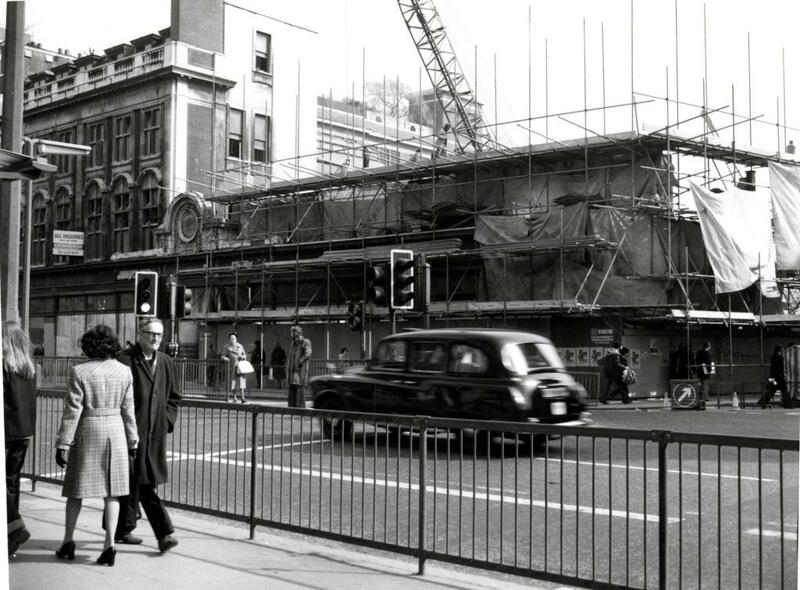 Kensington High Street October 1961. The corner of Wright’s Lane. The photographer has noted on the back: midday. It’s good to know that now. The street is busy. 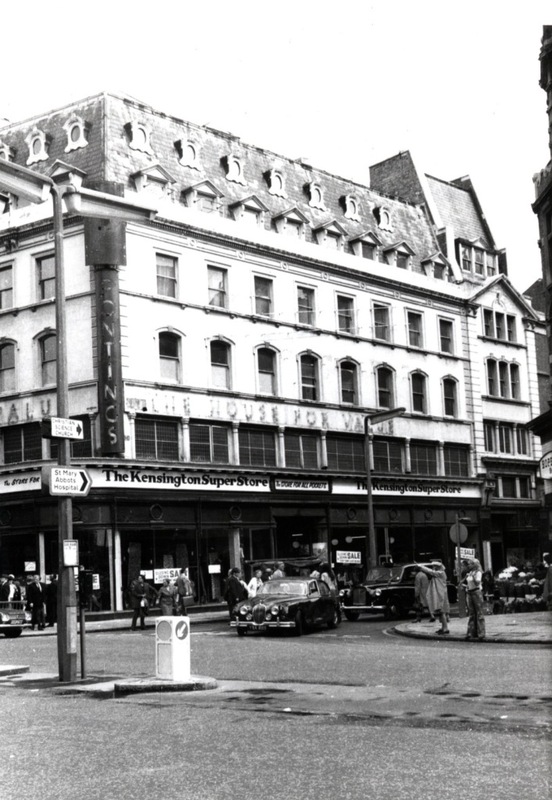 A shop called Hope Brothers (“outfitters”) is at the centre of the picture occupying the corner with its turret. Can you see behind the building the side of Iverna Court and the fire escape stairs which snake up the pitched roof allowing access from windows and precarious looking doorways? I checked and it’s still there today. This is the start of the Promenade,an 1890s development of shops and offices built by our old friend cheese magnate Jubal Webb, a rare example of a developer demolishing his own house along with the others in the Terrace (follow the link for more on the houses that used to be there). We’ll be following the Promenade down the High Street in a moment but before we do there’s another matter. 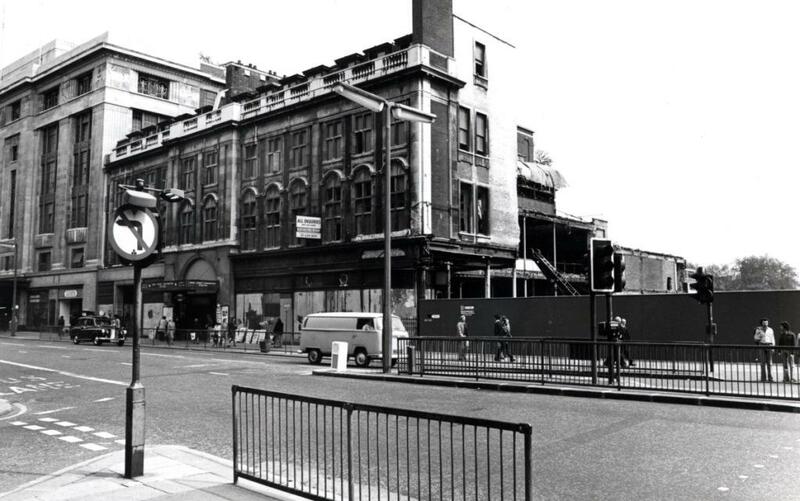 Just visible on the left is one of the signs for Pontings, the first of the three great department stores of Kensington High Street to disappear. Most of the rest of the pictures in this post come from the 1970s like this one from May 1976. And there it was gone. Not that its final years had been glorious. 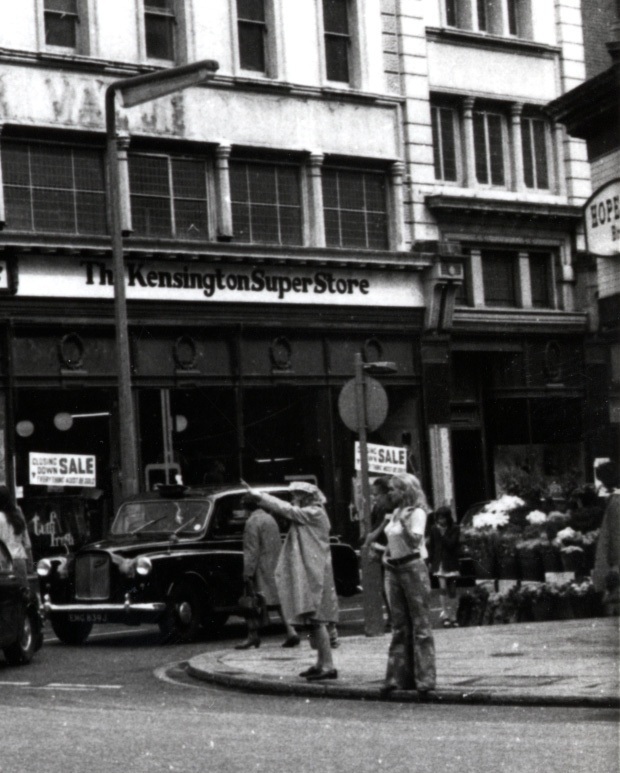 In 1971 the letters of the signs had all been pulled out and you were left with a discount shop called the Kensington SuperStore. There is a bit of a human drama in that picture to distract us form the sad fate of Ponting’s. The woman on the left is flagging down a taxi with her arm outstreched. But behind her the younger woman is also making a gesture which might be an attempt to sneak in first, or exasperation on account of her prior claim. We’ll never know who got the cab, but nice flares, Madam. Now back to 1976. I had just left college and spent the summer in balmy Kensal Rise. A group of us spent many afternoons in that memorable summer around the open air swimming pool in Willesden. 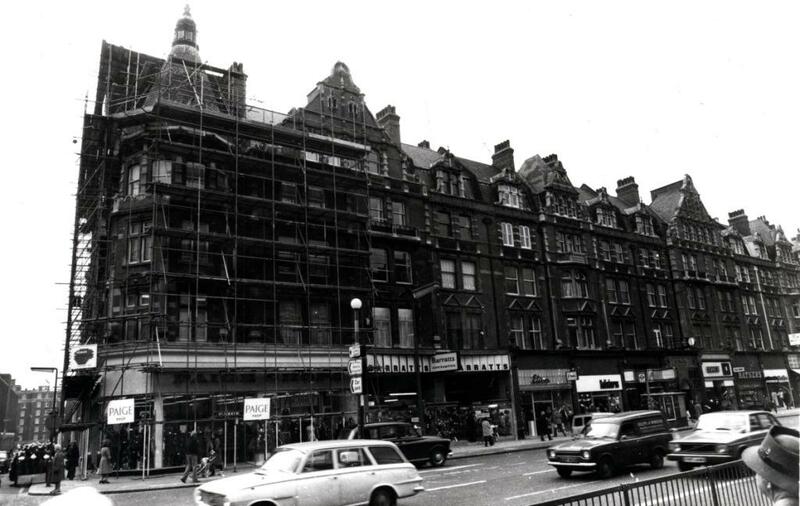 But by November I had a job in Soho so I was probably hardly ever in Kensington High Street where John Rogers was taking these pictures. Hope Brothers have been replaced by Paige Gowns (Ladies fashions). It’s hard to make out all the shops’ names at this size of image but I’ve looked at Kelly’s Directory for this year so I can tell you that you have Barratts (shoes), Etam (more ladies wear), Salisbury’s (handbags and fancy goods, with the Anglo-Austrian Society on one of the floors above), a boutique called Magique, the Village Gate (menswear), Saxone (shoes again – before the internet shoe shops were like a virus on any high street), the once ubiquitous Ratners (jewellry) and a Dorothy Perkins (ladies outfitters). I have some more pictures taken of this section by John Rogers but not dated so there are a few discrepancies but I’m sure they’re from the same period. In this pair of images you can see a Jean Machine and a shop called Woodhouse have slotted themselves in, along with the flash of a Citroen which looks like a retro car of the future speeding by. These two images give you an idea of the complex repeating pattern of rooftops on the Promenade. I’m repeating myself here but the Survey of London gives the best description: “orthodox, restless, ornamental”, three adjectives that cannot be bettered. Mindels (more leather goods – did these people never tire of leather? ), the Downtown boutique, Ravel (more shoes) and between them a shop with a blank front which at maximum magnification looks to me like an electronics or hi-fi shop. Are those LPs on a rack on the left of the entrance? You can also see a woman lifting a pram onto the kerb, and what looks like a woman being acosted by a man slouching in the entrance to Downtown. At the right a woman crosses the darkened passageway which leads into Adam and Eve Mews, where the Society for Psychical Research had its home for many years. We’re moving beyond the Promenade proper now but I think it’s worth it. 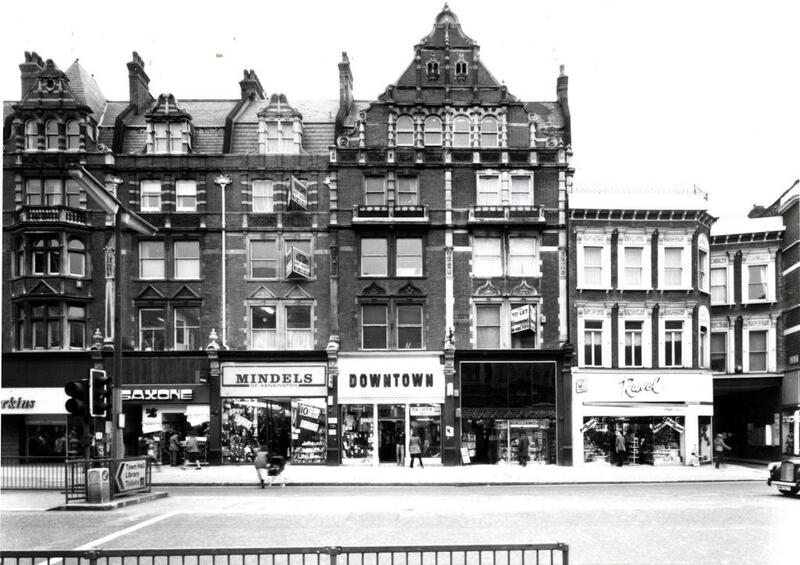 To see Dolcis (a shoe shop next to another shoe shop), Dixons, Brentford Nylons (a name I recall from frantic ads on radio for a shop where people with odd tastes could buy nylon sheets, among many other man made products). Kelly’s reveals a few of the businesses upstairs: Peterjohn Import-Export Ltd (a front for MI5? ), Centre Girl (employment agency), Sartorius Fashions Ltd (importers), Porten’s Secretarial College, Barber, May and Carstairs (auctioneers) and Naftamondial UK Ltd (petroleum traders) to name a few. These names bring back a whole way of life – office workers toiling in smoke filled rooms on obscure tasks, bosses dictating to secretaries and lots of paper files – which must have gone by now, although there must still be small businesses in those buildings. We’re heading for a particular shop now at 191-195. Let’s have a close up of someone on the street first. 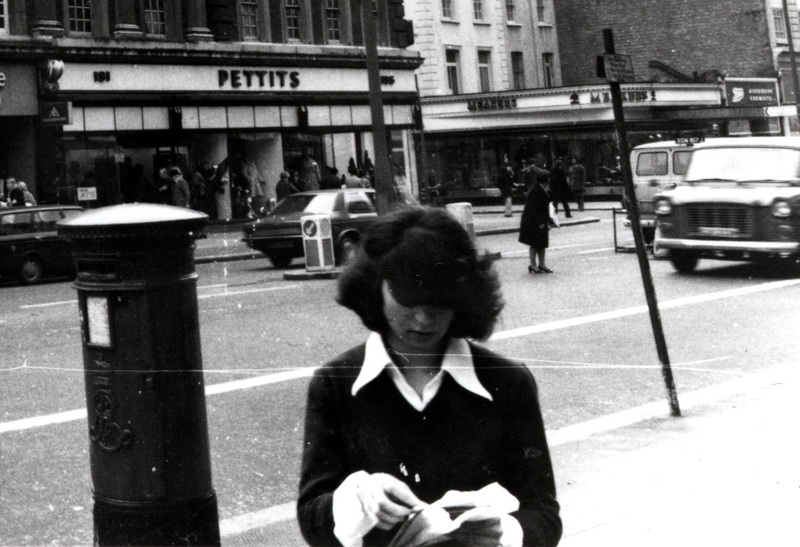 This young woman with her big collar and cuffs is sticking stamps on a letter for the post box behind her. She has a hair style I remember well, although I haven’t been able to discover if it has a name. 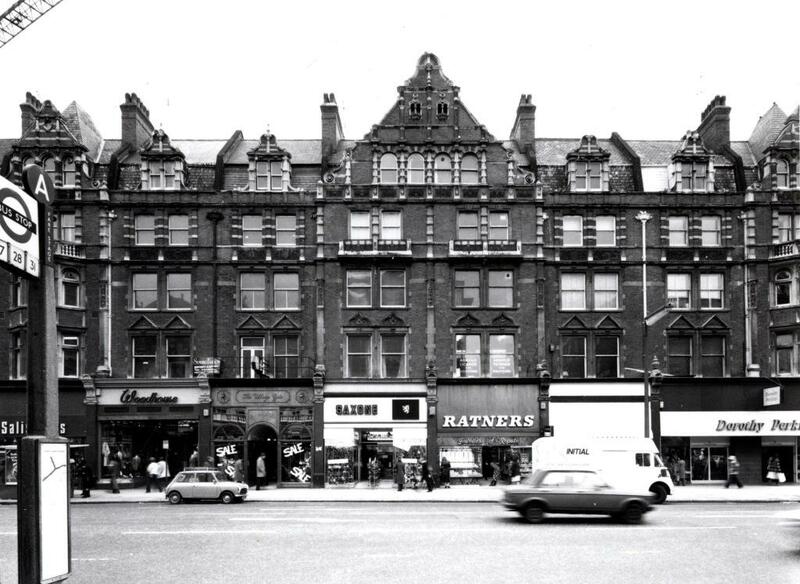 Along with a kebab resturant, another jeans boutique, a building society and positively the last shoe shop of the day (K, not named for Kafka’s hero I expect, but imagine Kafka writing a story about a street where you could only buy shoes) is Pettits (of Kensington, general drapers). 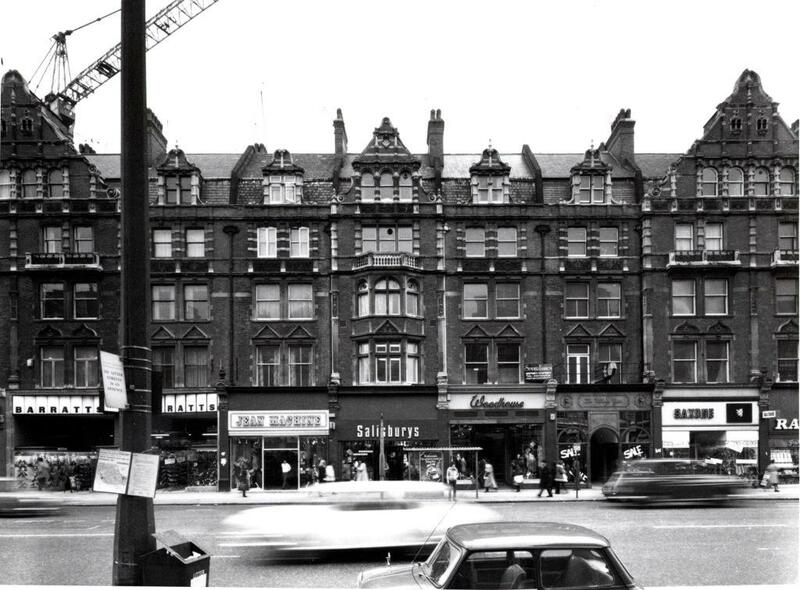 For those of you who didn’t know Pettits was the other shop after the three department stores whose name has lingered on in people’s memories, and I am often asked about it. Let’s go in. 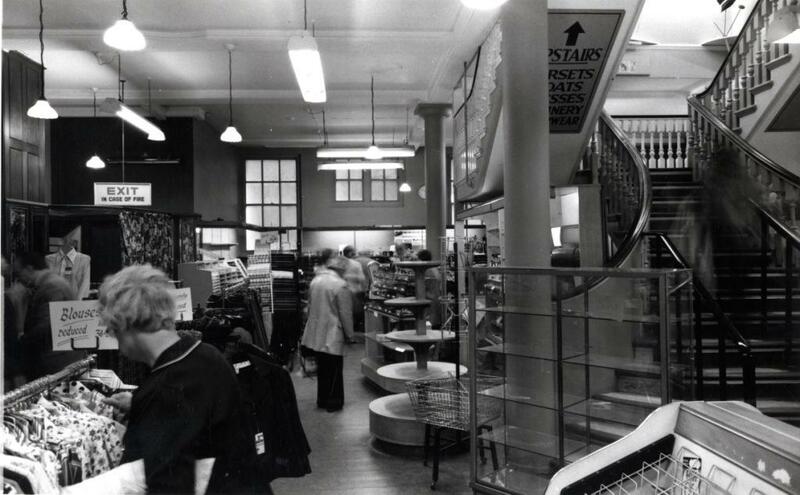 As you can see, Pettits was the home of many racks of ladies garments and accessories. Can you see the half-obscured sign next to the pillar? Upstairs: Corsets, Coats, Dresses, Millinery (maybe ) and Underwear (or Nightwear?). Habadashery and Soft Furnishings somewhere else .It looks to me like a shop for ladies of a certain age. Those corsets were not the modern fashion items, they were just foundation garments if I’ve got the term correct. 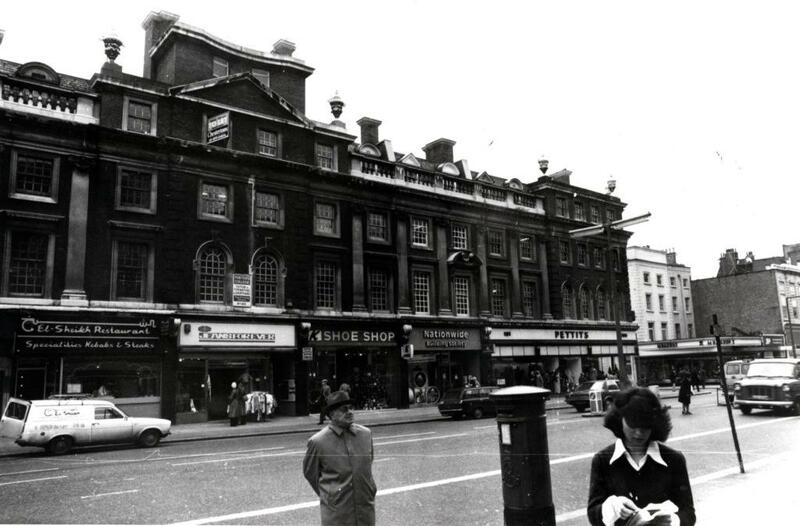 And this is 1977, the year of the closing down sale when my future wife was dragged down there by her mother. She bought a purple dressing gown. Pettits had survived its larger rivals but eventually succombed to economuic forces. I’m only featuring one picture because there are several more which might make a post of their own in the future. So let’s go home. 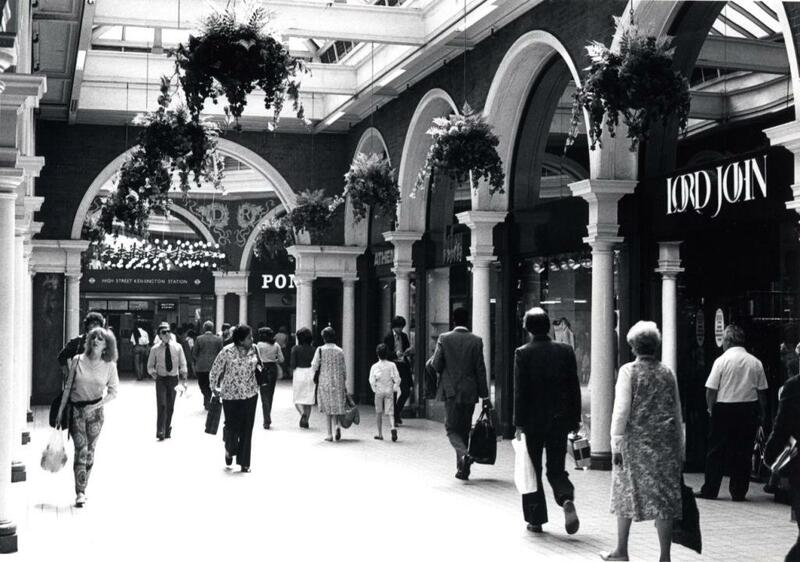 Walk back up the High Street to the tube through the picturesque arcade we can still enjoy today. 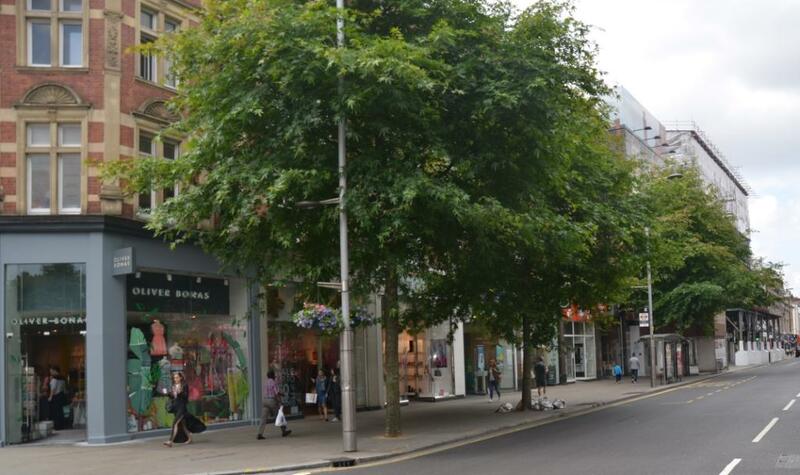 The High Street went through a rough patch a few years ago but now looks to be thriving again. These are the current shops on the Promenade: Oliver Bonas, East, Vince Camuto (shoes! ), EE, The Body Shop, Phones 4U, Aldo, an empty property, O2, The Kooples, Calzedonia, Russell Bromley (shoes) Orogold, Muji, Vision Express, another empty one and Hotel Chocolat (my favourite, obviously). More phones than shoes. The roofline is still restless after all these years. One big difference – trees. And it’s not usually as quiet as this. I took these pictures on a Saturday morning. This week’s post is the 206th post published but it’s the 200th written by me so it’s a personal milestone. When someone asked for an idea back in 2011 and I said “I’ll write a blog.” I never imagined that I would be able to find 200 topics to write about in the last (nearly) four years and still not have exhausted the collection or my desire to write about it. When I started, I ran at it picking off the best subjects, Hedderly, Cremorne etc not at all concerned with making them last. I now know that Burgess and Ascroft and Rush could easily have had several posts each like Markino and Menpes. Maybe they will yet. Other subjects really only get one shot, so you have to get it right. The big breakthrough I suppose was Linley Sambourne. I knew those pictures were good. It was a few years before the blog that I scanned them during a period when I discovered the pleasures of digitisation. I knew they would be useful one day and if I found the right angle would reach a lot of people. The success of those posts and others taught me to follow my instincts. And all the years of looking at pictures trying to see their stories have paid off. Blogging about our Local Studies collection has been both a pleasure for me and has taken the collection out of the archive room and picture chests into the big wide world, finding a gratifyingly large audience. I’m lucky to have ended up where I am today, showing people things they’ve never seen before and above all learning, finding interesting things, becoming obsessed with them and then saying: look at this. So thank you to everyone who’s read the blog, regularly or occasionally, made comments (Michael, Chris and Debbie to name only the most frequent), subscribed, followed us on Twitter, pressed the like button, and shared with us – pictures or memories. Without you it really wouldn’t work. And I haven’t forgotten my guest bloggers – Isabel Hernandez, Lucy Yates and the eminent historian Jonathan Oates, who have all made valuable contributions and given me much needed breathing space. Special thanks to them for their support and to the other members of my team – Tim Reid, Kim Smith and Katrina Wilson (who has now gone on to higher things). And as long as I’m thanking people my wife Cathryn and my son Matthew who have had to put up with me tapping away on my laptop at all hours. And can I just thank…… no, really, I’ve stopped now, honest. 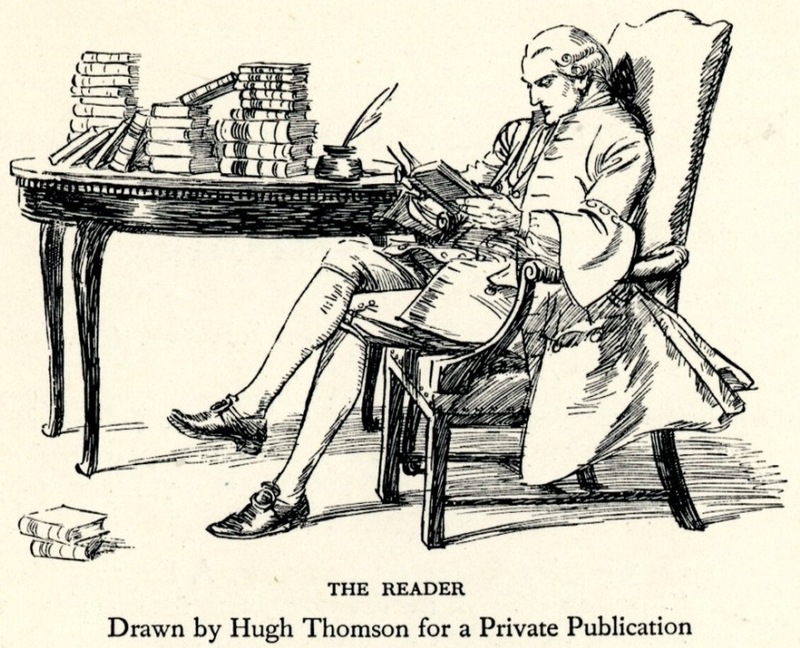 Hugh Thomson – my latest obsession. More of him soon. 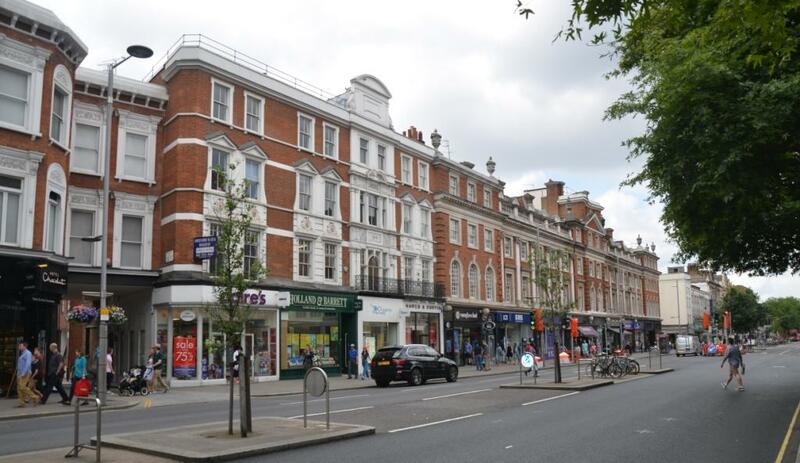 This entry was posted on Thursday, July 2nd, 2015 at 12:33 am	and tagged with John Rogers, Kensington High Street, Pettit's, Ponting's, The Promenade and posted in 20th Century, Kensington, Shopping. You can follow any responses to this entry through the RSS 2.0 feed. Please keep writing, Dave! I always enjoy your fascinating musings on the images. Happy 200! It is our good fortune. I’ve been following you for years and never tire of reading whatever you have to show us. Thank YOU! In 1972, give or take a year, I was trying on jeans in Jean Machine. The staff were preoccupied with the person in the next cubicle. Then she spoke and I recognised the voice – Lulu. Bet she buys classier clothes these days! In 1959 I visited London from Scotland for the very first time and stayed with my aunt Mrs Helen Taylor who worked in the make-up department in Derry and Toms on Kensington High Street. “Auntie Nettie” was a very beautiful woman who had a large house in Holland Road. I don’t really know why I am telling you this David but perhaps it is because your posts unlock thoughts and memories from all our pasts and for that i thank you most sincerely.200 posts double wow to that. Well done to Mr David Walker for making local history so wonderfully accessible to all of us out here and for providing us with an online destination of the highest order. Long live The Library Time Machine. 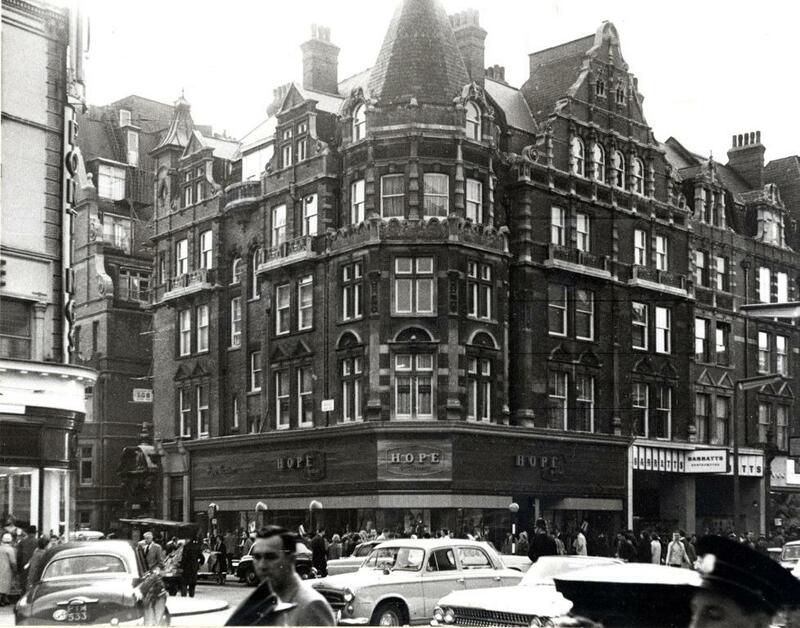 Around 1966 I was shopping along the Promenade, looking for a pair of swimming trunks. I found a ‘men’s outfitters’, on the south side, and went in. I told the two guys what I wanted, and soon realised they were as gay as a summer’s day, by their lewd remarks as to how I would look in the trunks. I got out fast. 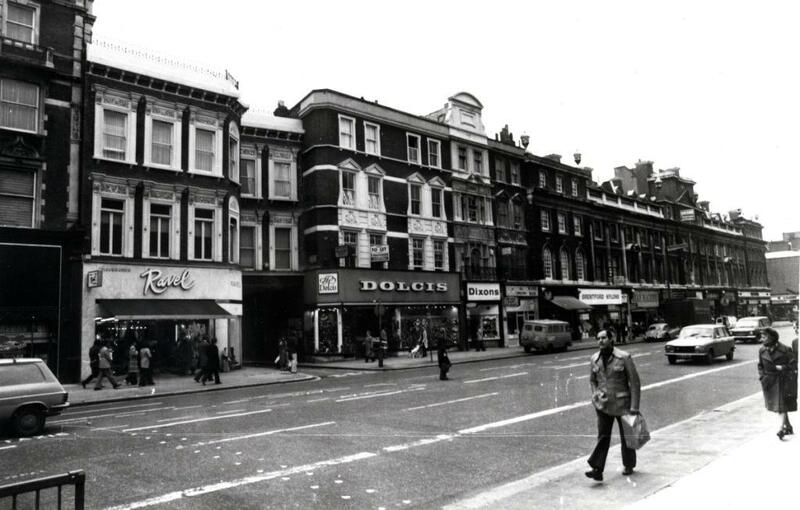 This is how I remember the High Street best—in the seventies. I’d love a post about Pettits. Second day here(.and I know ,I’ve led a very sheltered life),and I’m hook line and …..,anyway Dave your postscript above contains lovely words and marvellous sentiments and a joy to read.this work must take you yonks,thanks again .Anyway mustn’t tarry,got a lot of reading and looking to catch up on. That is amazing.It’s not the first time someone has found themselves in one of John’s photos but it’s always a special moment when they do. Thank you so much for writing in.